Buffalo Wild Wings have a number of seasonal specials for the 2017 holiday season including the Big Twist Pretzel and Thai Ginger Sauce as a wing flavor. 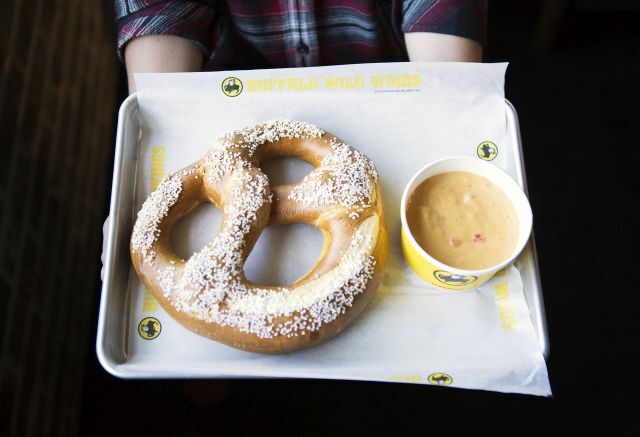 - Big Twist Pretzel - A bigger version of the chain's regular pretzel. It comes with a side of creamy queso and is meant to be shared. - All Star Sampler - An appetizer sampler platter that includes fried pickles, spinach and artichoke dip with tortilla chips, chili cheese fries, and a choice of either crispy or Naked Tenders with southwestern ranch dressing and another sauce of your choice for dipping. - Southwest Philly - Sliced prime rib seasoned with Desert Heat dry seasoning, queso, and pico de gallo on a grilled hoagie roll. - Big Daddy Jack Burger - A beef patty, hickory-smoked pulled pork, crispy onion rings, cheddar jack cheese, Honey BBQ sauce, lettuce, tomatoes, pickles, and red onions on a toasted bun. Natural-cut French fries come on the side. - Fried Pickles - Deep-fried, cornmeal-breaded dill pickle slices served with southwestern ranch dressing. - Thai Ginger Sauce - A sweet and sour combination of chili peppers, garlic, ginger and lime. The spice level falls somewhere between Asian Zing and Spicy Garlic. - Crispy Jumbo Shrimp - Lightly battered, deep-fried shrimp served with a sauce of your choice for dipping. - Spinach Artichoke Dip - Cheesy spinach artichoke dip topped with shaved parmesan cheese and served with tortilla chips. - Goose Island V Formation Pale Ale - Created in partnership with Goose Island, it's meant to be "a crisp, refreshing beer" with "subtle malty sweetness, balanced hop bitterness and tropical fruit notes." 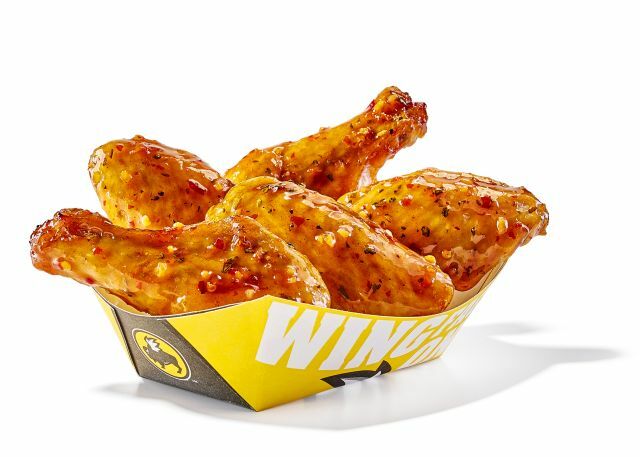 - Mango Habanero Twist - They collaborated with Ole Smoky Distillery to create new Ole Smoky Mango Habanero Whiskey, which is inspired by Buffalo Wild Wings' Mango Habernero sauce. The new Mango Habanero Twist features the whisky with Mist Twist and mint.